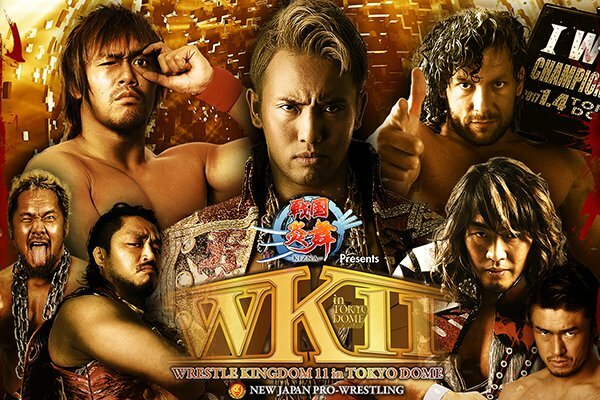 As they do every year on January 4th, New Japan Pro Wrestling presents their biggest show of the year tonight and into tomorrow morning as Wrestle Kingdom 11 takes place at the Tokyo Dome. This year's Dome show will be headlined by an IWGP Heavyweight Championship match with Kenny Omega challenging Kazuchika Okada. Omega won his spot in the match by winning last year's G1 tournament and defending the title shot along the way. An IWGP Intercontinental Championship match will be in the semi-main event with Tetsuya Naito defending against Hiroshi Tanahashi. That match will also feature the debut of Tanahashi's new theme music after he announced that he would be replacing his old music at the end of last year. NJPW's other titles will be on the line as well. Katsuyori Shibata will defend his NEVER Openweight Championship against Hirooki Goto, KUSHIDA will put his junior heavyweight title on the line against Hiromu Takahashi, and all three tag titles will be up for grabs. There will also be an ROH title match as Kyle O'Reilly takes on Adam Cole, Cody Rhodes will make his NJPW debut against Juice Robinson, and Kota Ibushi will again wrestle as Tiger Mask W against Tiger the Dark. Our live coverage begins at 2:30 a.m. ET with the New Japan Rumble. It was a battle royal in Japan. Save for the surprise entries and a few fun spots, not much of anything. Gunn and Elgin exchanged power spots. Cheeseburger came in and eliminated Bone Soldier. Liger came in to help Cheeseburger against Gunn and Elgin, but it didn’t work. Liger and Kobayashi did a nice exchange. Scott Norton came in and pinned Taguchi with a powerbomb, and he, Saito, Cheeseburger and Tenzan all ganged up on Elgin. He fought through, pinned Saito with a lariat and toppled Norton over the top rope. It boiled down to Elgin and Cheeseburger, who the crowd were into. They had a staredown, but obviously Elgin overpowered Cheeseburger, gave him the buckle bomb then pinned him with a spiral powerbomb. Solid match while it lasted. Kind of disappointing considering who was involved, but this wasn’t supposed to be Kota Ibushi vs. ACH. Tiger the Dark did a great fosbury flop to the outside. Tiger Mask came back and did the Golden Triangle moonsault. Tiger the Dark hit a tombstone piledriver but Tiger Mask kicked out. Tiger the Dark kicked out of the tiger suplex but was pinned by the tiger bomb. The Bucks lived up to their word being covered in gold in this year’s tournament by walking to the ring in gold outfits with the PWG, ROH, IWGP Jr. belts and new Superkick Party tag team titles. Good little match. Lots of fun spots and some clever storytelling with Romero, who was a weak link for a lot of the last year, coming back and scoring the win for his team. Bucks teased a countout spot early, though that doesn’t work because in New Japan titles do change hands via count out. Full of the quick back and forth action you’d expect from the Bucks and RPG Vice more than held their own. Baretta shifted around Matt Jackson on his shoulders and Romero dropped him down with a knee in a cool double team spot. Baretta went for a senton and landed flat on his back on the entranceway which did NOT look good at all. This left Romero by himself while the Bucks worked on Romero, double teaming him. Bucks went for More Bang For Your Buck but Baretta got up and stopped Matt, allowing Romero to crucifix Nick for the flash pin and the titles. Fine match. This was a case where you can do the "the refs have no credibility" line because there was a bunch of that here. Most of the work was fine, for the most part. The Chaos and Bullet Club teams started off. Ospreay came in and did some great stuff, including the Sasuke special on the outside. Page and Ospreay had some really good chemistry in the ring. They were on the outside when Yujiro got the first pinfall with the pimp juice DDT. This brought in the LIJ team. Match didn’t last long before LIJ did a ref bump and introduced chairs, laying out Yujiro with chairs. Sanada then submitted Yujiro, leading to the champions coming out. Finlay and Ricochet did a cool double senton to the outside. Kojima made a good hot tag. He was running wild until EVIL did a ref bump and BUSHI attacked Kojima with the mist. Kojima kicked out of a seated powerbomb by EVIL but didn’t kick out of the STO, making LIJ the new NEVER six man champions. Good for what this was. Cody shows natural heel charisma that translates well as a Bullet Club member, and looked fine here. Juice looked good here as well. Cody went for a springboard, landing on the floor but Robinson grabbed him and gave him and overhead suplex, then followed it with a cannonball into the barricade. Cody came back and focused on the leg, which Juice injured in the duration of the match. Cody trapped Juice in a modified Indian deathlock but Juice made it to the ropes. Juice went for the unprettier but Cody countered with the crossroads for the win. Cody berated Kevin Kelly and Steve Corino (who he focused on a lot during the match) after the match, spraying water at the latter. Very good match while this lasted. I wish this got more time as they were having a very intense back and forth match. Adam Cole appeared to be adhering to the Code of Honor, but spat at O’Reilly after doing it. Cole hit O’Reilly’s arm with a steel chair and worked on it. O’Reilly did a comeback and they had a good, hard hitting match. A lot of quick surges of back and forth shots. O’Reilly went for an armbar but Cole stomped on his head to break it. Cole laid out O’Reilly with a ton of superkicks then followed with a third Last Shot to win the title. This kind of felt like a cluster with everyone doing spots at the same time. Action was fast paced, and perfectly okay for the most part. The announcers were losing it during commentary because GoD constantly swore, using pretty much every dirty word in the book during the bout. GBH came in and took control. Honma had it won with the kokeshi but was broken up. Tonga caught Honma with a gun stun and but fought out of Guerilla Warfare. Yano gets the tag but everyone else is unaware. He’s taken out as Ishii faces off against the two. Yano low blows them, allowing Ishii to give both a lariat, which allows Yano to roll up Loa to win the titles for his team. First great match of the evening. This was the first match that felt like the crowd was there, as they were hot for everything and both guys did some great moves and had some really good sequences. Takahashi looked excellent in the last few minutes of the match. KUSHIDA started off hot early with a huge senton to the floor. There seemed to be a missed spot where Takahashi was supposed to hurricanrana KUSHIDA to the floor, but it didn’t work. That didn’t stop him from flying off with his scary looking senton to the floor. They did a great sequence leading to Takahashi leaping off the apron but KUSHIDA grabbed him in midair with an armbar on the outside. KUSHIDA locked in the hoverboard lock in the ring. Takahashi escaped. KUSHIDA fought for it again but Takahashi refused to budge. KUSHIDA laid out Takahashi with a straight right hand but Takahashi countered with an overhead belly to belly into the turnbuckle. Takahashi did an amazing waistlock rana bomb off the top rope, followed it with a running death valley driver into the turnbuckle and finished off KUSHIDA with the time bomb, signaling another title change. Really great match, one of the best they’ve had in a long time.This had great intensity too as the crowd picked up big time during this match. Lots of stiff back and forth shots. Shibata locked in the sleeper as Goto tried to get to the ropes but Shibata took him to the ground. Goto writhed until he finally got a leg on the middle rope. Goto fired back with headbutts and landed the ushigiroshi. He tried for the GTR but Shibata countered, only for Goto to come back with the shouten kai for a really good near fall. They did a sick series of headbutts that Goto got the upper hand in, hit an inverted GTR, then hit a regular one to, yes, win the title. All titles have changed hands thus far. Tanahashi debuted his new theme. It’s not High Energy and I’ll leave it at that. Awesome match. This had all the telltale signs of a big time title match and delivered, with tons of great callback spots and near falls. As far as Dome crowd reactions go this was the most heated I’ve heard them in years. Started off with your simple back and forth. Things heated up when Tanahashi hit a slingblade on the apron then hopped off with the high fly flow to the outside. Naito takes him down with a submission but Tanahashi counters with the cloverleaf, working on Naito’s injured knees that Tanahashi worked on early in the match. Tanahashi hit two sling blades and a high fly flow but Naito dodged a second and hit the Destino. Tanahashi countered a second. The two took turns stomping at each other’s knees until Tanahashi unleashed a dragon suplex, a high fly flow then went for another but Naito got the knees up. Incredible heat at this point. Naito hit the Destino off the top rope, then followed with another to retain his title. Kenny Omega came out to a movie scene from Terminator where he stole a guy's clothes, then came out wearing a terminator mask and carrying a gun. Okada came out with dollar bills streaming everywhere. Incredible match, it’s one of those matches that is already probably in contention for match of the year. They went about 45 minutes and started slow, but worked an incredible match with lots of great callbacks, some awesome spots, and a really hot 10-15 minute back and forth that will be very hard to emulate for years to come. Kenny Omega is a next level performer and showcased it here in spades. Like the previous match, mostly back and forth to start things off. They go to the barricades where Okada counters Omega by laying him out with a draping DDT. Okada brings out a table, a callback to a Road to show Omega sent Okada crashing through a table. Omega starts mounting a comeback, hitting a huge swanton on the outside then followed with a sick looking missile dropkick to the back of Okada’s head. Okada goes for an elbow, but Omega gets his knees up and gains control. He unleashes a baseball slide that sends Okada through the barricade into the announcer’s section, then flies off with a springboard moonsault all the way into the crowd. He follows that by slamming the table on top of Okada and hitting a double foot stomp off the apron. Meanwhile, on the outside, the Young Bucks have set up the table for Omega to use. They tease both going through the table. They go back and forth into the ring until Okada launches him off with a HUGE back body drop that sends him crashing through the table. Okada is reeling as Omega somehow recovers and they start teasing doing something off the top rope. Omega hits a dragon suplex that lands Okada RIGHT on his neck. Geez. Omega goes for the running knee strike but Okada counters with a German. Omega blocks the rainmaker but eats a dropkick. Omega fires back with the reverse rana and a knee strike. He tries for the One Winged Angel but somehow Okada lands on his feet and takes out Omega with the tombstone, then hits the rainmaker but Omega kicks out. Omega fires back with shots then rakes the eyes. Okada dropkicks him so hard he flies across the ring and into the turnbuckles. Okada goes for the tombstone again but Omega counters into a package piledriver. He hits a snap German suplex and a running knee strike, then another and goes for the One Winged Angel but Okada grabs Omega’s wrist jumps off and hits another rainmaker. He holds onto Omega but he starts firing back with really stiff shots. Undaunted, Okada hits another rainmaker but Omega again comes back and hits a really stiff knee to the face. Omega again goes for the One Winged Angel but Okada counters it, hits a jumping tombstone then another rainmaker for the win. Gedo and Okada cut a promo after the match, doing their usual stuff of how Okada is on a whole other level and will do the same in 2017. A really great show, with the last four title matches delivering what they set out to accomplish. Matches in the undercard could have been better, but all were solid and didn’t drag the show down. Not the best top to bottom WK card of all time, but this was a great show that’ll be tough to top in 2017.